Lo Hei, a cantonese phrase, literally translates to tossing up fortune and is a common tradition during Chinese New Year. 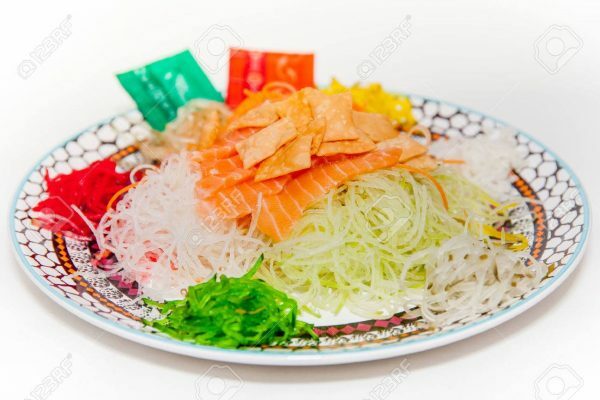 With the abundance of ingredients accompanying the dish, Yu Sheng, it is no wonder that many are confused. To prevent an awkward silence and to look like a professional for your upcoming annual Lo Hei session, here are the key steps to ensuring a successful Lo Hei. It is not uncommon to have more than one session of Lo Hei with families, friends, colleagues, and clients. Scheduling the dates of availability in advance with participants helps to avoid clashes. If you are feeling fancy, prepare long chopsticks for the Lo Hei. As the session can get very messy, with honeyed ingredients flying everywhere, try to avoid using wooden disposable chopsticks. The last thing you want to walk away with is a splinter after an enthusiastic Lo Hei on Chinese New Year. The final part of the Lo Hei includes a lot of honey or sweet plum sauce which cannot be consumed by diabetic members of the group. To be considerate, set aside an unsweetened and pre-tossed dish. This way, everyone can join in during the Lo Hei session, and diabetic members can eat the unsweetened dish afterwards. When putting the ingredients onto a common plate, do not forget to shower the room with loud and auspicious sayings. Here are the sequential phrases to recite (or cheer at) to keep the spirits high. Wish for abundance by shouting 年年有馀 (Nian Nian You Yu). For good fortune and luck, say大吉大利 (Da Ji Da Li) and complement it with other similar phrases such as吉星高照 (Ji Xing Gao Zhao). Here, you can toss in wealth-related phrases such as 招财进宝 (Zhao Cai Jin Bao), 金玉滿堂 (Jin Yu Man Tang) and 财源广进 (Cai Yuan Guang Jin). While drizzling the oil to symbolise money flowing from all directions, be sure to say 一本万利 (Yi Ben Wan Li). You should receive a nod of approval from your boss. To wish for good luck at your doorstep, say鸿运当头 (Hong Yun Dang Tou). Encourage all the ladies to echo after you as you wish for eternal youth with 青春常驻 (Qing Chun Chang Zhu). For employees looking to be promoted, 升官发财 (Sheng Guan Fa Cai) is a great phrase to use. Entrepreneurs praying for prosperity can say步步高升 (Bu Bu Gao Sheng) and 风生水起 (Feng Sheng Shui Qi) instead. Sprinkling peanuts symbolises a household filled with valuable possessions. As such, 金银满屋 (Jin Yin Man Wu) is an appropriate blessing to yell out. When Lo Hei-ing with clients, 生意兴隆 (Sheng Yi Xing Long) and 財源滾滾 (Cai Yuan Gun Gun) will help wish for a flourishing business. For family members, 和气生财 (He Qi Sheng Cai) is a useful phrase to wish for harmony, which will bring wealth. Kids and adults are sure to like eating this crunchy delight, so remember to buy an additional packet! You can inject wealth-related phrases such as 遍地黄金 (Pian Di Huang Jin) here. The final step of the ritual aims to usher in sweet relationships with the phrase, 甜甜蜜蜜 (Tian Tian Mi Mi). It is believed that the year’s prospects will be better the higher you toss. If none of the ingredients end up on your arm or hair, then you may just be doing it wrong. Besides the all-encompassing心想事成 (Xin Xiang Shi Cheng) and 万事如意 (Wan Shi Ru Yi) to wish that everything will go well as wished, or the overused恭喜发财 (Gong Xi Fa Cai) and 大吉大利 (Da Ji Da Li) for wealth and prosperity, below are some refreshing alternatives to consider. When wishing good health, instead of the standard 身体健康(Shen Ti Jian Kang), try福寿双全 (Fu Shou Shuang Quan) to bless someone with both longevity and happiness. For relatives who are still schooling, replace your usual 学业进步(Xue Ye Jin Bu) with金榜题名 (Jin Bang Ti Ming) to double the blessing as an opportunity to teach them something new. Longer phrases such as 四季平安過旺年 (Si Ji Ping An Guo Wang Nian), which wishes recipients a peaceful and prosperous year, is sure to impress. This Chinese New Year, broaden your range of vocabulary while enjoying the honeyed goodness. Ever wished you had a personal assistant? Well, this card acts as your omnipresent butler!